1 of 7 Heat broiler. Coat a 2-quart broiler-proof baking dish with nonstick cooking spray. 2 of 7 Place chicken breast on greased broiler pan and broil 4 inches from flame for 6 to 7 minutes per side until internal temperature registers 160 degrees F. Remove to plate and cut into 1/2-inch pieces. Keep warm. 3 of 7 In a large nonstick skillet over medium heat, cook bacon about 5 minutes until crisp. Chop and reserve. 4 of 7 Cook pasta following package directions, about 12 minutes. Drain. 5 of 7 Stir flour into milk and combine with soup and garlic salt in a medium-size saucepan. Simmer for 2 minutes until thickened; stir in 3/4 cup of the cheese. 6 of 7 Return pasta to pot and stir in chicken and soup mixture. 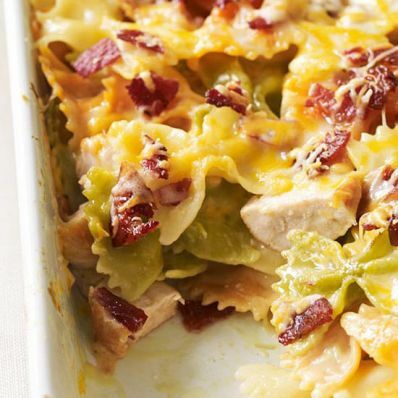 Spoon into prepared baking dish and top with bacon and remaining 1/2 cup cheese. 7 of 7 Broil 4 inches from flame for 2 to 3 minutes or until heated and lightly browned on top. Serve immediately. Per Serving: 11 g Fat, total, 65 mg chol., 5 g sat. fat, 3 g fiber, 782 mg sodium, 492 kcal cal., 33 g pro., 65 g carb.